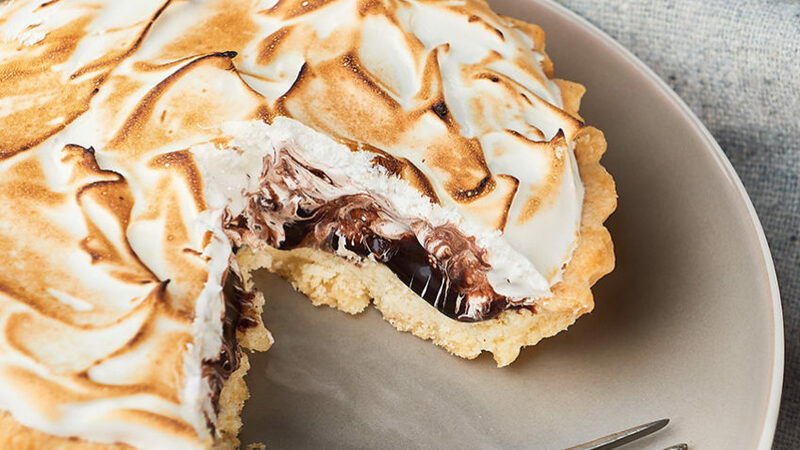 This chocolate meringue pie is a southern classic. 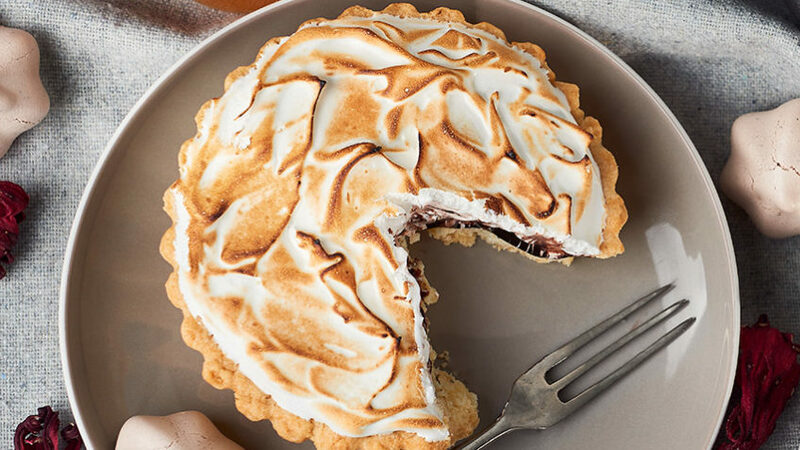 Tender pie crust is filled with luxuriously rich chocolate filling and fluffy and airy meringue. A truly unbeatable combination. I love homemade pies. My mom used to make them so did my grandma. Thank god for the stand up mixers, because they used to beat the meringue by hand. I guess a nice arm workout was a bonus. Chocolate custard filling is just stellar. It is sweet and delicate. Melt-in your-mouth texture with a decadent chocolate taste. Thick and smooth consistency is oh so tasty. Just phenomenal. 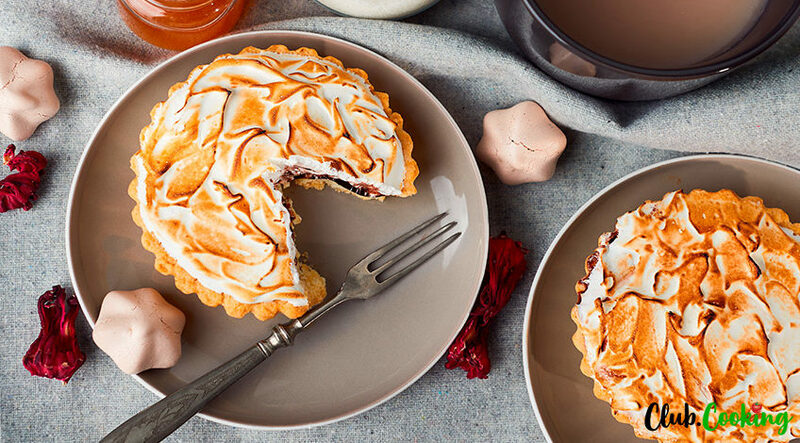 Meringue is light and floatable with just a touch of sweetness. Those two fillings are a perfect compliment to each other and create an ultimate balance of flavors and textures. Making this pie seems like an ambitious resolution. 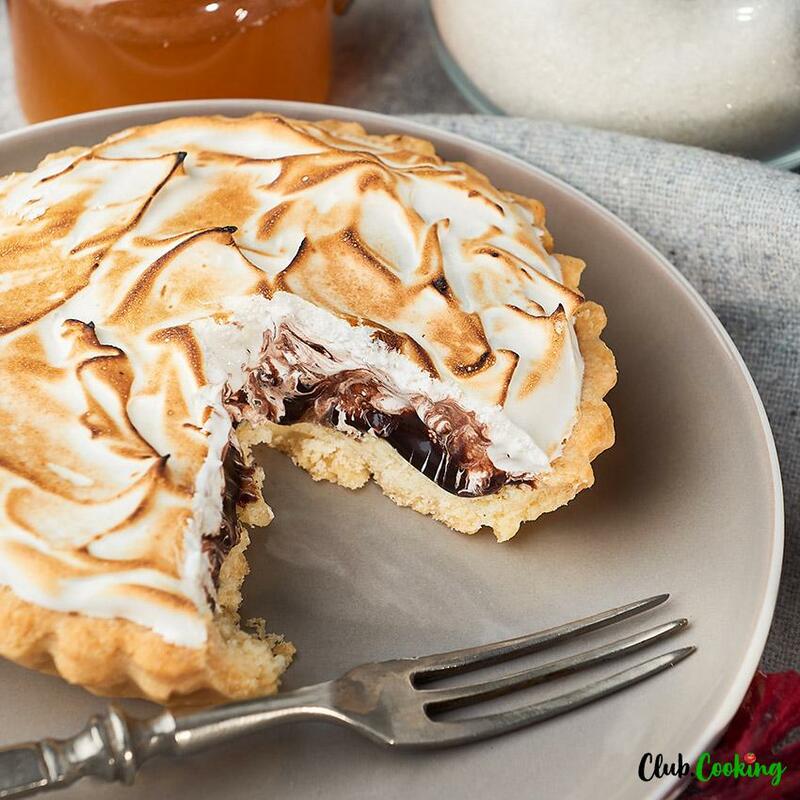 It is truly a labour of love: you make a pie crust, you make chocolate custard filling, you whip up the meringue. But trust me it is so worth it in the end. Nothing can beat a homemade pie! 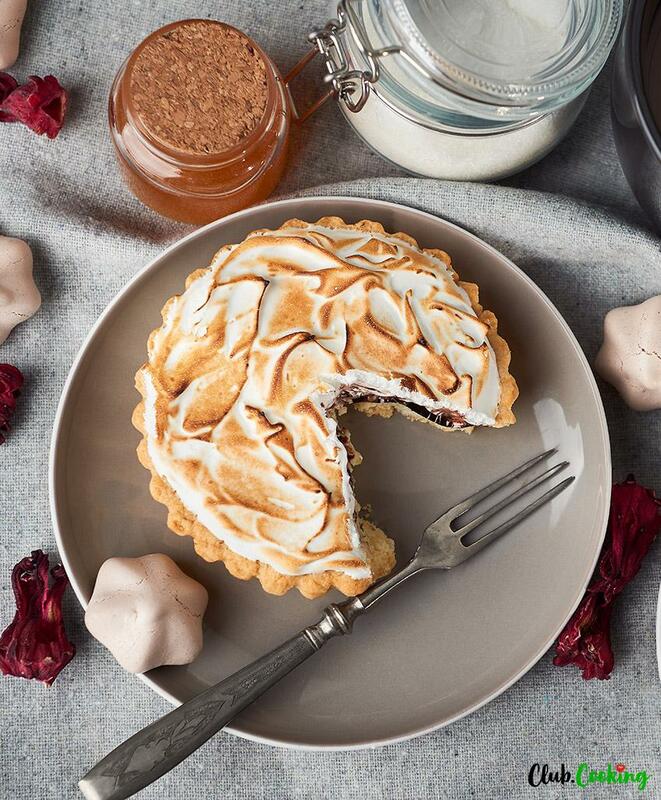 This chocolate meringue pie is definitely worthy of a company! It is a solid, foolproof recipe to make for a special occasion like Christmas or Thanksgiving. It comes out great every time. Don’t be intimidated by the meringue. It is actually super easy to make. Just remember to separate eggs while they are cold out if the fridge and make sure no egg yolks leak in. Beat the meringue in a completely moisture and grease free mixer bowl. 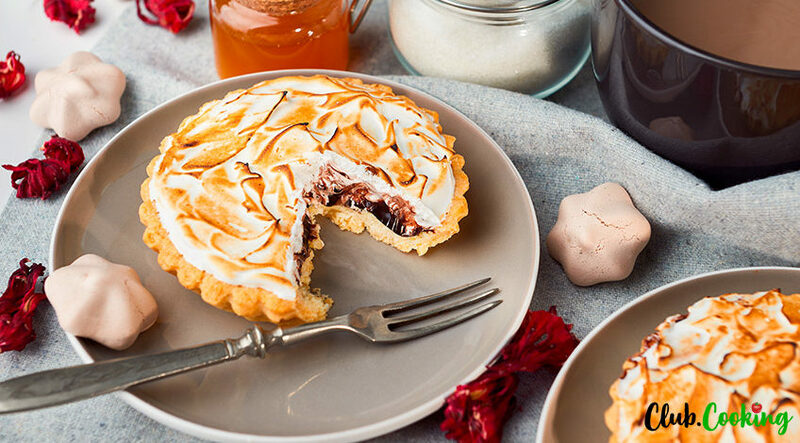 You will be rewarded with snowy white, glossy, beautiful meringue! The pie is very appetizing and pretty. The smell coming out of the warm oven while the pie is cooking is taunting. The hardest part is to wait for it to be ready! Prepare Pastry. Preheat oven to 450 degrees. Combine flour and salt in a large bowl. Cut shortening into flour with a pastry blender until mixture resembles small peas. Push mixture to one side of bowl. Drizzle 1 tablespoon water along edge of flour mixture. Use a fork to toss some of the flour mixture into water. Move mixture to opposite side of bowl and repeat with 2 more tablespoons of water. Gather the dough together with your hands. You can add a little more water if the mixture is too dry, but it is best to add as little water as possible. Shape dough into a disk and place on a lightly floured work surface. Prepare Chocolate Filling. In a medium saucepan, combine sugar, cornstarch, unsweetened cocoa, and salt. 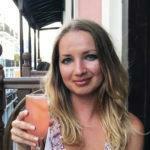 Gradually whisk in both milks. Cook, whisking constantly, over medium-high heat until mixture comes to a boil. Boil for 1 minute whisking continuously. Remove from heat and gradually whisk a small amount of hot mixture into egg yolks. Continue to add hot mixture to egg yolks while whisking constantly until approximately 1/4 of the mixture has been added to the egg yolks. Pour egg yolk mixture into the saucepan and whisk well. Cook mixture, stirring constantly, over medium heat for 3 minutes. Remove from heat and whisk in butter and vanilla extract. Cover with plastic wrap and keep warm.